So a hot tip on a cargo freighter loaded with valuables seems like a great prospect for an easy heist and a fast buck. Until the heist goes wrong, and the freighter explodes. Suddenly Frey isn’t just a nuisance anymore – he’s public enemy number one, with the Coalition Navy on his tail and contractors hired to take him down. But Frey knows something they don’t. That freighter was rigged to blow, and Frey has been framed to take the fall. If he wants to prove his innocence, he’s going to have to catch the real culprit. He must face liars and lovers, dogfights and gunfights, dukes and daemons. Retribution Falls was a bit of a gear change for me. I do quite a lot of dark in my books, and I decided it was time to lighten up and have fun. So that’s what I did, and the result is Retribution Falls – a swashbuckling, action-packed caper starring a group of sarcastic, cynical, wisecracking liars. I was channelling Iron Maiden’s Aces High for the battle scenes, so expect planes with machine guns a-blazing, tipping into screaming dives steep enough to give you a red-out. This is retro-fantasy at a thousand miles an hour with the fun turned up to maximum. As you can tell, I’m rather excited about it. 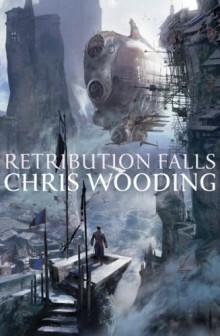 Update: Retribution Falls was shortlisted for the Arthur C. Clarke award 2010, which was hyper awesome to the max +3. It didn’t win though, otherwise I’d have made it to +5.